Click to viewAfter 250,000 downloaded SDKs, 25,000 official beta developers applicants (only 4,000 accepted), the Application Store is finally coming in July. And it's going to be full of applications. 62 countries bringing a breakthrough way for developers to wirelessly deliver their applications directly to iPhone and iPod(R) touch users around the world. Users can download applications wirelessly and start using them immediately. "Developer reaction to the features, power and simplicity of the iPhone SDK has been incredible," said Philip Schiller, Apple's senior vice president of Worldwide Product Marketing. "We are seeing some truly amazing native apps from our developers and think users are going to love the breadth and depth of the applications available from the App Store." "The SDK allowed us to build a groundbreaking new AIM client in record time," said Kevin Conroy, executive vice president, AOL. "The platform's elegance and ease of use has inspired our developers to create innovative new web and SDK based experiences for iPhone and iPod touch." "The iPhone SDK has given us an excellent set of tools and APIs to create mobile extensions for FIM's entire portfolio of web brands including MySpace, IGN and Photobucket in the near term, and other properties such as FOXSports.com down the road," said John Smelzer, senior vice president of Mobile for Fox Interactive Media. "The popularity of the iPhone, along with the high demand for applications, gives us an amazing opportunity to create ground-breaking mobile experiences." "Cocoa-touch is a compact and robust application framework that handles all the heavy lifting for developers so they can concentrate on building their applications in record time with the legendary Apple finesse we've come to expect," said David Krantz, president of YELLOWPAGES.COM. "iPhone has been a game changer since it launched, and the availability of our YELLOWPAGES.COM application on the App Store is going to make a great device even better." "As mobile developers with primarily J2ME and BREW experience, we were up and running with the iPhone within two weeks," said Jonathan Backer, manager of Mobile Engineering, The Walt Disney Company. "The hardware is stable and full-featured, while the software development tools are intuitive and represent a level of polish rarely seen in the mobile arena." "Since the launch of the iPhone we have seen a steady rise in traffic to the MLB.com mobile site so it made perfect sense to develop a rich client application for the App Store," said Adam Ritter, vice president, Wireless Major League Baseball, Advanced Media. "Our development staff was excited to work on an iPhone application and reported that the SDK was robust and straight forward and contained helpful development tools. All combined we were able to expedite our development and deliver an application we know baseball fans will enjoy." The free beta iPhone SDK can be downloaded at developer.apple.com/iphone/program. Membership to the iPhone Developer Program is available worldwide. 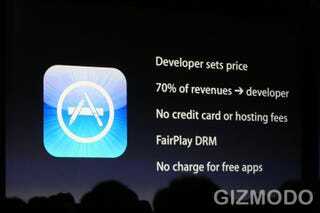 Developers set the price for their applications — including free — and retain 70 percent of all sales revenues. award-winning computers, OS X operating system and iLife and professional applications. Apple is also spearheading the digital media revolution with its iPod portable music and video players and iTunes online store, and has entered the mobile phone market with its revolutionary iPhone. NOTE TO EDITORS: For additional information visit Apple's PR website (http://www.apple.com/pr/), or call Apple's Media Helpline at (408) 974-2042. (C) 2008 Apple Inc. All rights reserved. Apple, the Apple logo, Mac, Mac OS, Macintosh, iPhone and iPod are trademarks of Apple. Other company and product names may be trademarks of their respective owners.